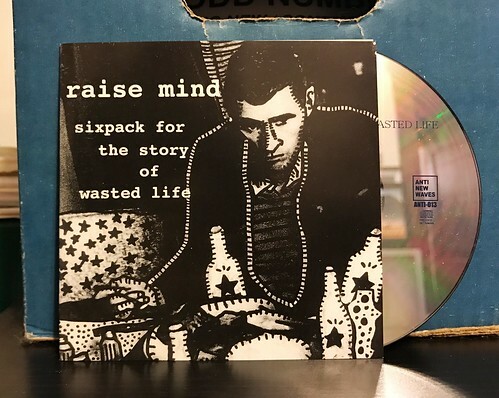 Raise Mind is a Japanese band that I was familiar with long before ever going to Japan. I've had their Back Number CD since it came out, though I was not aware they had any other releases out. I probably should have been paying more attention to places like Discogs, but it all worked out in the end as I picked up this six song EP while in Tokyo. To me, Raise Mind always fell right in the middle of bands like Dillinger Four and Cradle to Grave. They're not quite as fast and crazy as Cradle to Grave, but they're not as poppy as Dillinger Four. Instead, Raise Mind hits the sweet spot right in the middle. Gruff but melodic. Punk but catchy. Fast but not crazy. Really, it's a pretty perfect balance. Just take the song "Step Outside." It's relatively straightforward and mid tempo, but it's practically perfect. Palm muted guitar riffs take you through the chorus twice before paying things off with a big, hooky chorus. I wish I could fid the song online somewhere, but you'll have to trust me on this one, top notch. The funny thing is, after consulting Discogs, I'm also missing another split CD from Raise Mind. Looks like I need to go back to Tokyo for some more record shopping.